Are Mitchell's Brownlow hopes in strife? A stirring 28 point win to the Kangaroos, who broke the game open in the first half, and held on bravely in the second. Cunnington was vital for the Kangaroos with a match high 30 disposals, 18 contested possessions, including six clearances. The Kangaroos transition the football from defensive 50 to inside forward 50 uninterrupted for the seventh time today, and the sixth time for a score, this time a goal to Zurhaar. Waite now with a team high seven disposal inside forward 50. All of these disposals have been scores but he has only executed these kicks at 29 per cent efficiency, kicking 2.5 (17). A critical inside 50 tackle by Breust forced the Hartung turnover that resulted in the Gunston goal for the Hawks.That was Breust's second tackle inside 50, however the Kangaroos lead the count overall 127. After having the first inside 50 of the quarter, the Kangaroos have now conceded the last five inside 50s of the match, although they have been able to hold the Hawks goalless during this time. Kangaroos InterchangeShaun Atley off due to an injury. Daw with a critical spoil in a one on one contest with Roughead to negate the Hawks' scoring opportunity. Daw has had a team high five spoils for the match, Frawley with a match high seven to his name for the Hawks. The Hawks kick their first goal from a mark today as Breust kick kicks his third goal of the match. Breust has had ten disposals for the match as well as three tackles and two marks. For the first time today the ball is transitioned from a kick in to inside forward 50 for a score, and in this instance has resulted in the goal to Smith for the Hawks. A significant delay in the match as Higgins in stretchered from the field. The VickersWillis injury is likely to result in the mandatory concussion test, potentially leaving the Kangaroos down two players on the bench for the time being. Kangaroos InterchangeEd Vickers-Willis and is possibly out for the game. Kangaroos InterchangeShaun Higgins and is possibly out for the game. The Hawks with the first three goals of the second half from seven inside 50s, with the Kangaroos only having two inside 50s to their name. The Hawks recorded their lowest first half inside 50 count for the year so far with 19. For the first time today the Hawks transition the football from backward of centre for a score, a goal to Breust. The Kangaroos have kicked 4.2 (26) from possession chains that have originated in their defensive half. Similar to the start of the second quarter, the Hawks kick the first goal of the third quarter off the back of a VickersWillis turnover by hand inside defensive 50. 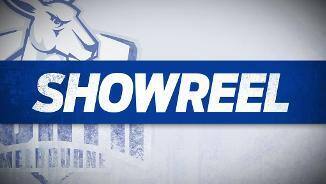 The Hawks have kicked 3.0 (18) from turnovers, the Kangaroos 9.4 (58). A goal right on the siren to Waite sees a dominant Kangaroos take a 57 point lead into the half time break. Dumont leading all players with 15 disposals, while Brown has been unstoppable with four first half goals. North Melbourne making a push of its own late in the quarter, now with the last five clearances, seven scores, and nine inside 50s. Brown for the Kangaroos contributing in all facets of the match, this time a smother inside 50, with the resulting turnover seeing Hartung kick a goal against his former side. The Kangaroos have executed four smothers this quarter to the Hawks' none. The Kangaroos are weathering a push by the Hawks who are attempting to get themselves back into the match. The Hawks with a streak of five inside 50s for no score. McDonald breaking the streak with the Kangaroos first inside 50 for almost eight minutes. Four players for the Kangaroos now into double figure disposals, with the Hawks yet to have player over nine disposals. Higgins, Cunnington and Dumont all with a current match high eleven disposals. 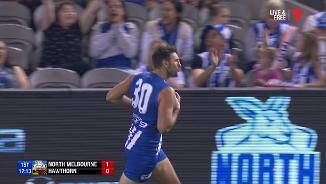 Another goal to North Melbourne from a mark inside 50. The Kangaroos now with eight marks inside 50 to the Hawks' one. The Kangaroos have kicked 6.2 (38) from the ensuing set shots on goal. 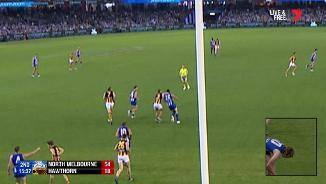 A free kick to North Melbourne off the ball has turned a kick in for the Hawks into a shot at goal for the Kangaroos from the top of the goal square, resulting in a goal to Atley. North Melbourne lead the free kick count 82. An explosive first quarter from the Kangaroos with 12 scoring shots to the Hawks' two, resulting in a 35 point lead. The Kangaroos lead the total disposal count 10685, contested possessions 38-28, inside 50s 16-11, and clearances 11-6. Sicily with a turnover by foot for the Hawks from the kick in as Thompson takes his first intercept mark of the match. Each team now with three intercept marks. Hawks InterchangeJames Frawley off due to the blood rule. Atley with the goal assist as he hits Ben Brown on the lead inside 50 for the Kangaroos. Brown now with three goals from three kicks. Atley with four first quarter disposals. The Kangaroos are playing a short kick and mark style possession game so far in the first quarter. They have had 29 short kicks to the Hawks' 14, and have taken 30 marks to 13. The Kangaroos are taking the clearance fight up to the Hawks today, leading the count 74 early, after winning the first six of the match. Jacobs for North Melbourne leading all players with three to his name. Both of Brown's two goals for the Kangaroos have come from a mark inside 50, one contested, one uncontested. 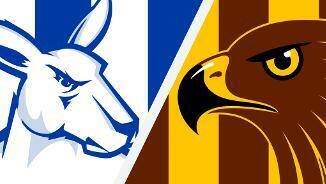 Brown with two kicks for two goals..
A Dumont turnover by hand inside defensive 50 for the Kangaroos allows the Hawks to kick their first goal form their fourth inside 50. Both sides with seven turnovers so far in this match. Mirra for Hawthorn spoils his own team mate Frawley, allowing Waite to crumb the football and kick North Melbourne's first goal from his first kick off the day. North Melbourne average only 35 clearance per match, ranked 14th in the league, with Shaun Higgins its best clearance player averaging just over 6 per match. Hawthorn comes into the match as the leading clearance team in the competition, averaging 44 per match, and with the league's leading clearance player Tom Mitchell, averaging just under 12 per match. Welcome to Etihad Stadium for the North Melbourne v Hawthorn Round 5 clash. 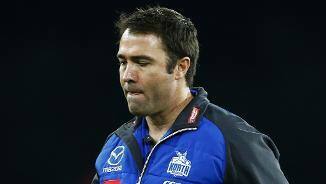 PREDICTING how far North Melbourne will fall had become a blood sport and the Kangaroos' stunning response at Etihad Stadium on Sunday – while tempered by the end – was equally brutal. North, playing two men down, held off a fast-finishing Hawthorn by 28 points, 14.14 (98) to 11.4 (70), to claim the prized scalp it craved and needed to thrill coach Brad Scott. 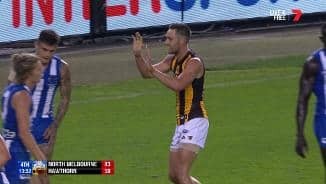 The upset came after they led by 57 points at half-time on an extraordinary afternoon of drama and carnage, including Hawk Tom Mitchell potentially putting his Brownlow Medal chances in danger. WATCH: Is Tom in trouble? "Today had a bit of everything. 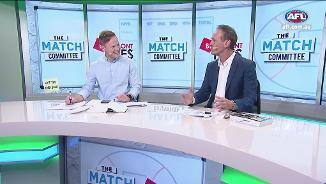 (We were) fantastic offensively and defensively early, and you're only able to do that if you've got really good contest effort, which we did," Scott said post-match. 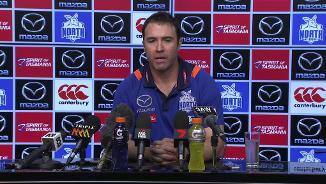 "We knew at half-time that Hawthorn are a very dangerous side and that they would respond. "Unfortunately, we lost a couple of guys (Shaun Higgins and Ed Vickers-Willis) in the one passage of play and that certainly compounded what was happening. Hawthorn were very accurate in front of goal as well. "I thought it showed character and fight, when we were clearly running out of legs, to not only stem the tide, but to push back the other way and score ourselves." 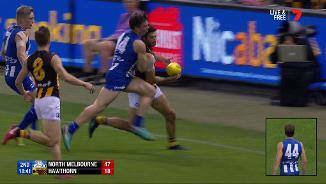 Mitchell made high contact with his right elbow to North ruckman Todd Goldstein in the second term, an incident that will undoubtedly have Match Review Officer Michael Christian's attention. It followed young Roo Cameron Zurhaar's second quarter report for rough conduct on David Mirra after barrelling him into the fence rather than tackling him. But North was left desperately hanging on after three quick-fire Hawthorn goals to start the second half preceded two Roos going down with sickening concussions within seconds of each other. Shaun Higgins firstly ran into Ryan Burton with ball in hand – with the Hawk, like Zurhaar, opting to bump instead of tackle – then Ed Vickers-Willis hit the deck in the same passage. Burton's hit, which resulted in a head clash, is sure to keep Christian busy on Monday afternoon. Vickers-Willis managed to eventually run from the field, but a stretcher was required to remove Higgins, whose wife gave birth to the couple's first child in the early hours of Sunday. Neither player returned and Higgins was taken to hospital, leaving North Melbourne short on soldiers as an inspired Hawthorn launched some belated rearguard action with a six-goal-to-one third term. The Hawks' stunning resurgence, after a dismal first two quarters, threatened at one stage to be the game's biggest-ever comeback from a half-time deficit. The record was almost half a century ago, when Collingwood stunned St Kilda from 52 points down at the main break. Hawthorn entered the contest ranked second in the competition in clearance differential compared to North's lowly 17th, but none of that mattered in the early going. Ben Brown (four goals, by early in the second term), Jarrad Waite (3.5) and Jack Ziebell (two) wreaked havoc as the Roos' surprise clearance dominance was matched by their ability to deny the Hawks possession. They led the clearances 11-6 at quarter-time and 24-14 by the main break – and won them 37-25 at the final siren – and Robbie Tarrant (20 disposals, 16 marks) and Scott Thompson (20, 11) brilliantly led their stout defence. Arden Street's resident tagger Ben Jacobs also finally blunted Mitchell's influence, restricting him to only 19 touches and three clearances while winning 19 and seven himself. Tough onballers Ben Cunnington (30, six clearances and six tackles) and Trent Dumont (23) were also outstanding in the initial onslaught. The 35-point quarter-time buffer was reminiscent of North's famous takedown of previously unbeaten Adelaide in Hobart last year, but this time it had to hang on. Luke Breust (five majors) and Liam Shiels, who kicked two of the first three goals in the third quarter, ignited a bitterly disappointing Hawthorn outfit, while James Sicily (28) hung tough in defence. Shiels (lower back spasms) later joined the walking wounded. Once the Hawk roll started, especially with the Roos' fewer playing numbers, it didn't look like stopping – and they got within 19 points on a Jack Gunston goal only eight minutes into the last term. But a steady Zurhaar set shot followed by Waite's third secured a memorable North Melbourne win. 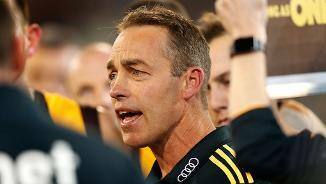 Hawthorn coach Alastair Clarkson was effusive in his praise of the Roos. 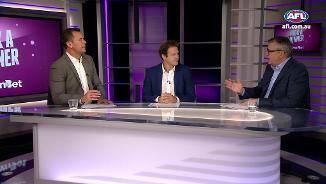 "We played against a pretty good opposition and I think the footy world might give a bit more credit to and maybe we should as a footy club, too," Clarkson said. "They showed us a clean pair of heels in so many facets of the game in the first half it wasn't funny, so to the credit of our players … at least we fought the game out and gave ourselves a chance. "We couldn't win it at ground level and we couldn't win it in the air, either, so we were bleeding a fair bit in the first half." North Melbourne: Shaun Higgins and Ed Vickers-Willis both suffered concussion in heavy collisions seconds apart in the third quarter and took no further part. Vickers-Willis was able to run from the ground and reported feeling "fine", but the Roos' doctors ruled him out. Higgins remains at the Epworth hospital under observation, but coach Brad Scott said we was "coherent in the rooms". "He remembered that his wife gave birth this morning, so that was a good result. He's had an eventful day … the early signs are promising, but we won't know for sure until they've done all the necessary tests." Hawthorn: Liam Shiels was the Hawks' sole injury concern after leaving the game for good late in the third term with lower back spasms. 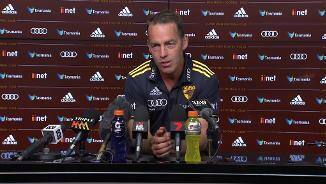 Coach Alastair Clarkson said he didn't have an update on his vice-captain, but was optimistic about his prospects of playing next week. "Sometimes they're injuries that stop you from being able to participate right there and then … he could quite easily recover from that quite well and play next week." The Kangaroos will try to win three matches on the trot for the first time since claiming the opening nine games of 2016 when they host Port Adelaide on Saturday afternoon. Hawthorn returns to the field in Launceston on Saturday night against a St Kilda line-up that showed genuine pluck to share the points with the Giants in round five.